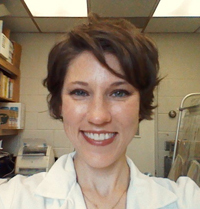 As a member of the Suflita lab and the Biocorrosion Center team, Dr. Lenhart’s projects are aimed at understanding the corrosive properties of bacteria and bacterial biofilms, when exposed to metal surfaces (i.e., oil pipelines, reservoirs, and fuel ballast tanks). Biofilm-mediated corrosion is a well-established phenomenon that is thought to be highly dependent on extracellular polymeric substances (EPS). The bacterial EPS, which is composed of polysaccharides, lipids, proteins, and nucleic acids, forms a protective layer that can affect the iron chemistry of the metal and lead to corrosive iron sulfide levels. In this regard, Dr. Lenhart is working with Dr. Iwona Beech and Dr. Recep Avci to create immunoimmobilized bacteria (immunomicroarrays) placed in mini-reactors that can provide a model biofilm used for studying corrosion under varying Fe (II), fuel, and seawater conditions. This will be performed using known corrosive sulfate-reducing Desulfovibrio spp., as well as our model hydrocarbon-degrading organism, Desulfoglaeba alkanexedens ALDC. Dr. Lenhart would also like to isolate and identify the constituents of D. alkanexedens EPS layer, and determine what role this EPS may have in metal corrosion. In addition to these biochemical-based projects, she has also had the opportunity to collaborate with Dr. Kathleen Duncan in utilizing molecular sequencing techniques to identify bacterial sequences isolated directly from corroded oil pipeline cuttings. These data, in combination with advanced surface analysis and microscopy techniques will allow the team to associate specific bacterial groups with pipeline corrosion pits, thereby identifying which bacteria might be good corrosion indicators. Dr. Lenhart is also interested in proteomics-based analyses which will help elucidate the genome and hypothetical proteome of new model organisms, such as D. alkanexedens. These types of studies will lead to further understanding of how such organisms metabolize and possibly transport hydrocarbons and their degradation products.